If you’re looking for job security then it’s probably best to work for a family business. That’s because family businesses are more likely to retain staff during downturns in their fortunes, compared with their non-family counterparts. Family businesses are also more likely to create jobs. Here are some numbers to back all this up. 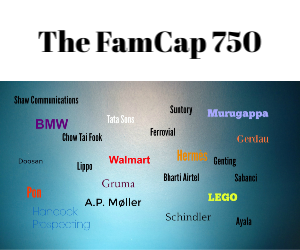 The top 500 hundred family businesses in the world, as measured by the Global Family Business Index, employed 21 million people in 2016, whereas the top 500 businesses in the world, as measured by Fortune magazine, employ 27.9 million. But for every $1 trillion of output generated by family businesses, 3.2 million jobs were created, whereas for the same output for the top 500 family businesses only 2.3 million jobs were created. OK, the figures may be a bit abstract to comprehend, after all, many of the top 500 businesses in the world are family controlled. But many aren’t – and if family businesses are creating nearly a third more jobs than their equivalent non-family firms than there must be something in the view that family businesses retain their staff during tough times and create more jobs at all times. Data at a more local level tends to bear this out. One of the best places to see this trend is in Spain, which suffered near economic collapse between 2008 and 2013. Research from the Institute for Family Business in Spain and a group of local universities showed that, instead of cutting jobs during the sharp economic downturn in the Spanish economy, family businesses actually continued to hire. The research found that per €1 million of revenues invoiced, Spanish family businesses increased the number of staff by 5.1 in 2013 – when unemployment was close to 30% – compared with 4.7 employees for the same amount of revenues in 2007, before the start of the crisis. All this suggests family businesses do care about all their stakeholders and their staff is very much part of those efforts. Non-family businesses, particularly the listed ones, where shareholder value and financial analyst scrutiny on efficiencies are the driving force, look like they are more likely to employ less staff and certainly less likely to retain them during a downturn. Of course, the reverse of this outcome for the efficiency merchants is that non-family businesses, or at least the listed ones, tend to create more output for each input of unit of labour used. But is it always about efficiencies as determined by some spreadsheet analysis? And if the top 500 family businesses were inefficient why are they still around, with their average age being 88 years-old? But this also raises another question: Do stakeholder values matter for listed family businesses as much as for privately controlled family businesses? That probably needs to be looked at in more detail.